The Northern Hairy-nosed Wombat is one of the world's most endangered species. It's actually more rare than the Giant Panda, and it's heartbreaking to think this beautiful animal may soon be forever lost. 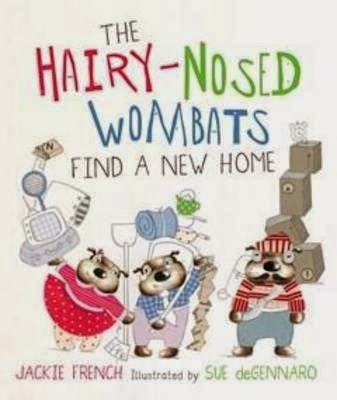 Jackie French has a well-known passion for wombats, and in this gorgeous book, she helps 176 of them to find a new home--away from the fires that burn their land, away from the floods that wash through their burrows. So, off they go--the boys first--on an exploratory mission to relocate themselves and their possessions. It must be out of flood reach, it must have tasty grass and it must be so good, they're encouraged to have lots and lots of tiny Hairy-nosed wombats. Classically gorgeous illustrations by the amazing Sue DeGennaro make for a delightfully colourful and humorous tale that will enchant little kids. At the back of the book, an author's note and the true history of this beautiful wombat will enchant older kids. It's heartening to see these 176 wombats succeed in relocating and reproducing. Let's hope this gorgeous book translates to real life real soon. All author royalties from the sale of The Hairy-Nosed Wombats Find a New Home are being donated to the Wombat Foundation for research and care.